A lot of gas and dust had been gathering in a certain corner of the Milky Way. It was 4,630 million years ago, that’s 4.63 billion, if you can get your head around big numbers and for some time, the gas cloud had been getting denser, thicker, heavier, blocking out the light from nearby stars. As atom piled upon atom, each attracted by the mass of other atoms at the centre of the cloud, space was warming up as the heat generated by the pressure built up. Close by the cloud, it was too hot to be exposed and the gravity was so strong, any particle, atom, rock or passing comet, was pulled in towards a terminal meeting with the cloud, a guaranteed end to existence. One day, maybe it was a Monday, the last atom required to set off this time bomb rocketed into the cloud and the crushing gravitational mass began fusing the hydrogen and helium atoms under the incredible pressure, releasing a steady stream of energy radiating out in all directions and a brilliant white light of hot plasma lit up the area for billions of miles. We call it The Sun. The full story of how it came to be, can be found in …..
‘Day 21: The Birth of The Sun’. The gravitational forces were so powerful, every scrap of material for millions of miles was pulled into the nuclear furnace that was fusing the gas atoms at millions of degrees. Way out in the blackness, where the gravity was weakest, a few rocks were orbiting the star like weights on the end of a string, travelling too fast to fall into the fire but too close to escape, doomed to spend forever or even longer trapped on the longest voyage possible. 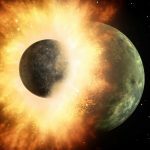 In total, they made up less than one percent, less than one fifth of one percent, a minuscule 0.14% of the material within influence of the star. Our planet is just a small part of that 0.14%. We are a million times smaller than The Sun. A trifling 130 million years later, our bit of rock was still a bit warm from all the ‘aggregation’ a fancy way of saying lots of rocks were piling in on top of each other melting the early adopters until we had a core of molten magma containing a handy few million tonnes of gold and other heavy bits. On the surface, the rock was still moving there too, oozing around at about 1200 degrees Celsius. Above the bubbling cauldron, the atmosphere was a heady mixture of nitrogen, carbon dioxide and a touch of water vapor. Sorry, no oxygen. 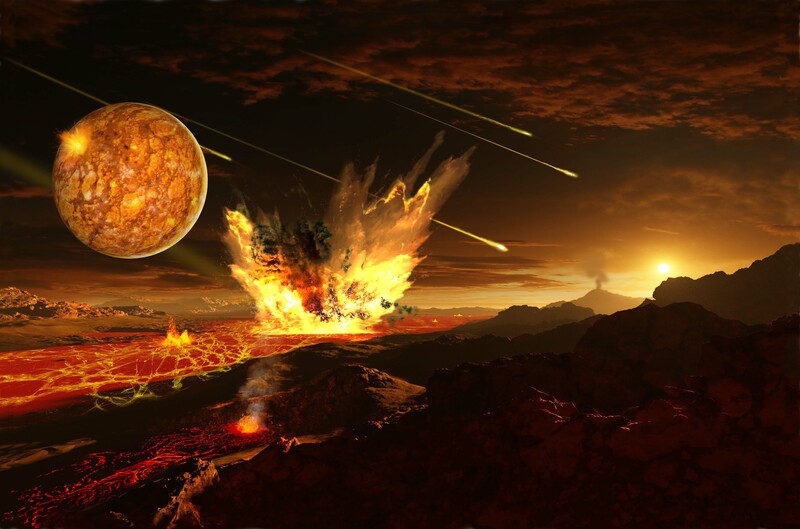 While the earth was waiting for things to cool down a bit, it could not avoid the annoying interruption of large bits of rock that were the left over crumbs from the Sun’s table. Annoying as being pelted with rocks can be, it was nothing compared to the visitor that was set to arrive a little while later. Just 155 million years after our little planet got a start in life, just a baby, a rather hot babe, a little sister arrived. Yes indeed, we used to have one more planet in our neighbourhood and her name was Theia. She was by all accounts, a cute little thing, about the size of Venus and she popped in travelling at about 5 times the speed of a bullet. ‘Day 25 – The Day The Earth Crashed’. 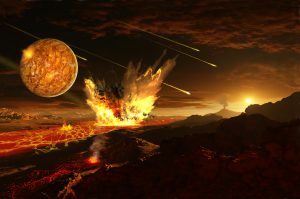 For the next 100 years, a microsecond of Universal time, rocks that got themselves blasted off into space, rained down, upon the earth, creating some mighty splashes in the molten goo. The interesting bit was that only about half came back. “What happened to the rest”?, one may ask. Look up my son, on most nights you will see the other bit. Yes, it’s the moon albeit a lot further away than on that sunny morn. It took a good half a billion years for the temperature to drop far enough for the surface rock to solidify, forming a thin, hard crust on a liquid core. 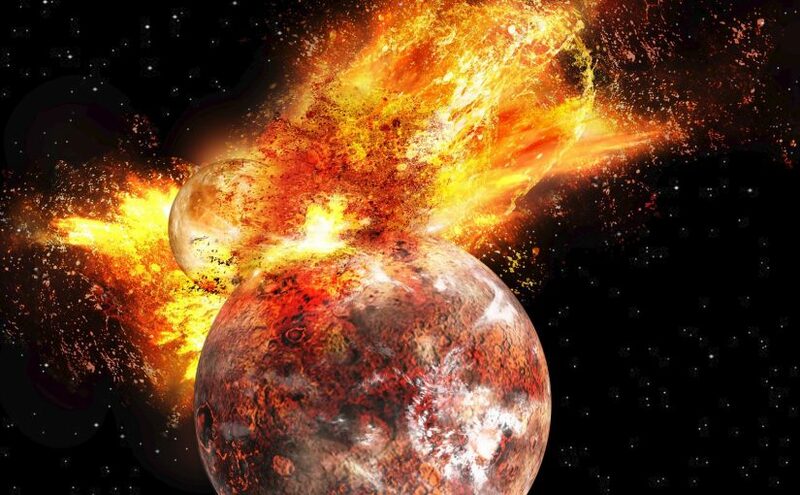 The earth was tilted off the vertical by 24 degrees by the massive impact with Theia which will turn out to be a very good thing, giving us the seasons that will stimulate and sustain life, when it finally arrives. 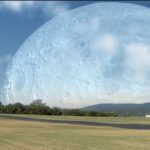 By the time The Sun has its second birthday, the Moon has moved away from its initial position, a very close 22,000 kilometres, to 68,000 kilometres away. 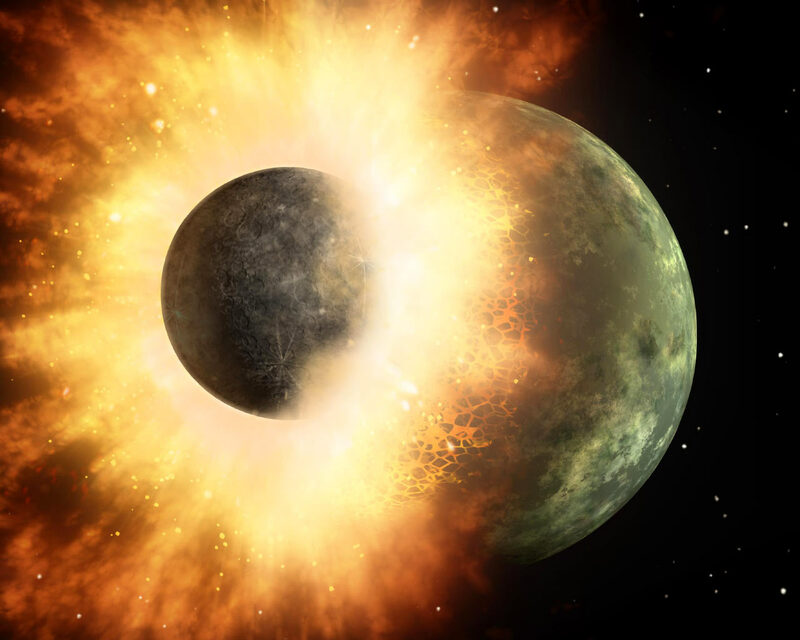 The accumulation of rock over the past half billion years, including the donation by Theia, has added considerably to the mass of the earth which encourages even more debris, pulled in from the outer reaches by earth’s strong gravity of the mass of the rock and iron core composition. By the third lap around the galaxy, water degassed from the mantle together with vast volumes delivered by billions of meteors, primarily composed of ice, covers the whole solid surface of the planet. By ‘Day 32’ the earth has slowed down a bit, from the giddy 6 hour day just after the collision, to a slightly more sedate seven and a half hours. Over the next 200 million years volcanic activity really got underway, pushing up many islands across the whole planet. 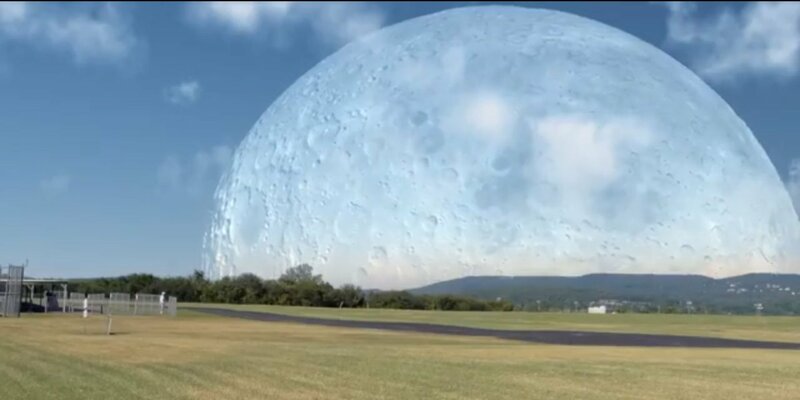 The moon is 87,000 kilometres away now, (50k miles) and still causing massive 1,000 foot high tines. 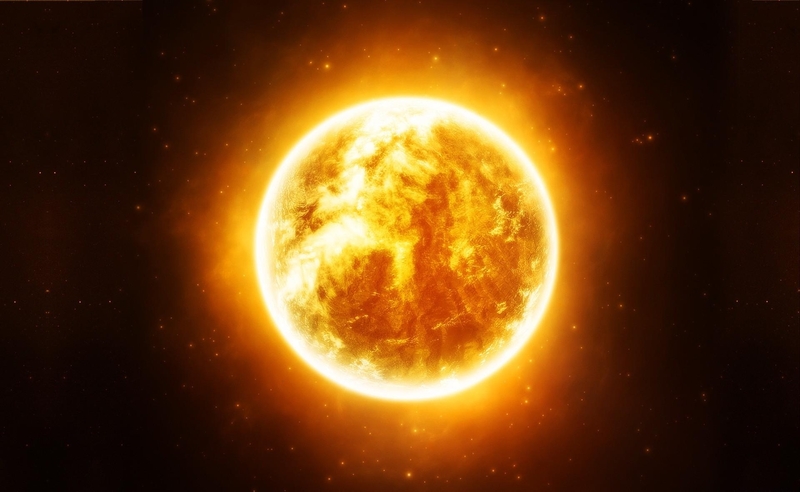 By ‘Day 35’ the sun completes its fourth orbit around the centre of our galaxy, and as the earth’s spin slows to a 9 hour day, molecules of chemical elements form the first single cell. 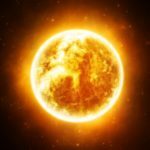 This article covers just about 20 ‘Days’ in the Diary of the Universe, the full list of 300 events can be found here. There are about 300 ‘Days’ of Earth History, listed in our ‘Diary of The Universe’ poster and it’s interesting to follow the development of our little patch. You can download the whole poster for printing.